Advantage's calving ease pedigree is double stacked with 6807 and EXT, two of the most trusted foundation bloodlines in the breed. He displays tremendous balance, excellent muscle shape, and great fleshing ability in a moderate, practical package. 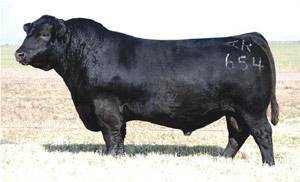 He was a high seller in Duff's 2007 Bull Sale.